“Mama, can we go to fro-yo, tonight?” Oh, how I wish we could go get frozen yogurt every night. (Frankly, I sometimes do after my daughter has gone to bed.) However, as a parent, I can’t justify letting my child eat that many sweets. I am a self-proclaimed sugar-aholic. I don’t want my daughter to have the same weight issues I did as I struggled to gain control over my sweet tooth. That’s why this dessert is fantastic. Ice Cream in a Blender! However, it is not ice cream in the traditional sense. All you need for this recipe is bananas and milk. There is no added sugar whatsoever. This recipe takes a little prep work, so you will need to plan a day ahead of time. First, take a bunch of bananas that are just starting to turn brown. Peel each banana and break it into chunks. Place these chunks in a plastic Ziploc freezer bag and freeze. I plan for at least one banana per person. Let freeze at least 24 hours. 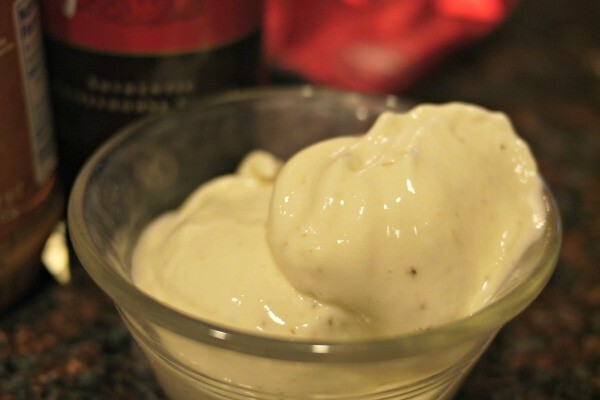 Place frozen bananas in a blender and pour in 1/2 cup of milk to start. Blend. If the bananas get stuck and you hear a whirring noise from unmoving blender blades, stop the blender, stir with a long spoon to dislodge the bananas and add a little more milk. Keep doing this until you have a consistency that looks like this: Scoop out banana ice cream using an ice cream scoop. We like to top ours with a few chocolate chips, a little bit of chocolate syrup or some peanut butter. This ice cream is creamy and delicious and doesn’t have a strong banana flavor. I recommend eating the entire batch because it does not taste as good if stored in a freezer – a strong banana flavor is present. Whenever my daughter asks for banana ice cream, I’m happy to oblige. And my husband is a pretty big fan as well. My daughter and I like to go on weekly dates every Friday after school. It’s a time I use to talk with her and to have a little treat that has no redeeming nutritional value. Friday dates are a blast! This past Friday, we chose Starbucks so that we could indulge in Frappucinos off their secret menu. Well, secret to some extent. Since Starbucks makes drinks to order, you can have them combine whatever flavors you desire. You just need to tell them exactly how to make it. Our choices this time? 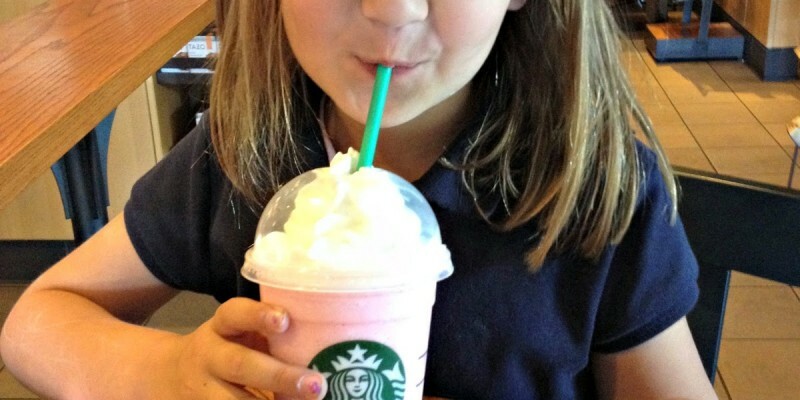 Cotton Candy Frappuccino. Made with: Vanilla Creme Frappuccino as a base 1 pump raspberry syrup Harry Potter Butterbeer Frappuccino Made with: Vanilla Creme Frappuccino 3 pumps toffee nut syrup 3 pumps caramel syrup caramel sauce drizzle I recommend the cotton candy variation. The drink is very reminiscent of the candy floss and was yummy to both my daughter and me. We didn’t enjoy the Butterbeer as much. I felt the toffee nut flavor was overwhelming, so that it didn’t taste like Butterbeer really but was more like having a Toffee Nut Frappuccino. Ordering off the secret menu is a lot of fun! I used the website: http://starbuckssecretmenu.net It works very well on a cell phone. I just browsed over to the recipe and showed the barista. If you are intrigued by the concept of secret menus, I also recommend the website Hack the Menu What Starbucks variations do you recommend? Love clam chowder, but can’t justify the heaviness of it? Try this slow-cooker recipe that lightens up this delicious soup. Although most of the fat has disappeared, the soup is still very creamy and has a ton of flavor. As a bonus, it is incredibly easy to prepare. You will need:1 Tbs extra-virgin olive oil1 onion, diced2 ribs celery, diced2 tsp minced garlic2 cans clams (8 ounces each)1 bottle (8 ounces) clam juice3 potatoes, cut in bite sized cubes (I used red potatoes)1 can (12 ounces) 2% evaporated milk Heat the oil in a medium skillet over medium heat. Throw in the onion and celery. Cook until the onion becomes translucent (about 12 minutes). Add the garlic and cook for 1 minute more (or until you can smell the garlic). Transfer the mixture to the slow cooker. Add the clams (with juice), bottle of clam juice and potatoes to the slow cooker. Stir well. Cook on high for 2 to 3 hours, or on low for 3-4 hours. I found that 3.5 hours on low worked well for this recipe. Stir in the evaporated milk the last hour of cooking. Season with pepper and serve. Tabasco green sauce would also make a tasty seasoning. I served this soup with a salad (greens, turkey, pepperoni, mozzarella, tomatoes and green olives) and bread rolls from the bakery. 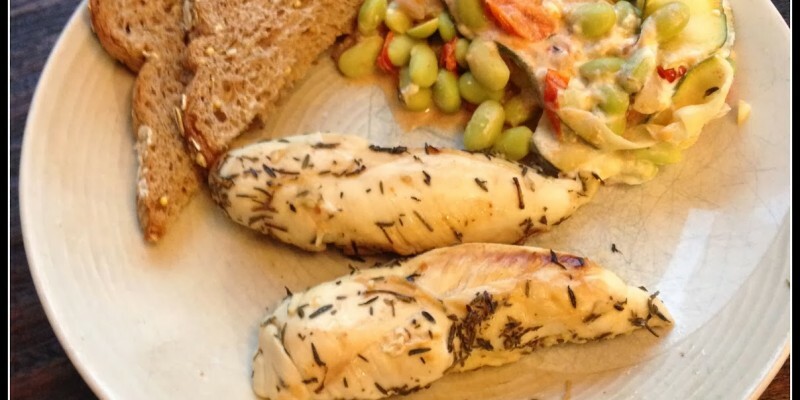 It was a very easy and tasty weeknight meal. Enjoy! Recipe from The Runner’s World Cookbook. Once…I went to Georgia. It was my cousin’s wedding and the rehearsal dinner was held at this spectacular BBQ place. The pulled pork literally melted in my mouth. As a semi-vegetarian (in that I didn’t really like meat all that much, so ate a lot of cheese based dishes instead), I had no idea meat could taste that good. Every time I’ve eaten at the BBQ place since then, I have ordered the pulled pork off the menu and hoped it would be as amazing. I’m always disappointed. This crock pot recipe comes pretty darn close to the deliciousness of that Georgia restaurant. The best part is that it is super easy and makes the house smell good all day. You will need: 5-6 pound pork shoulder roast 2 yellow onions, sliced 3 Tbs chili powder 1 tsp coriander 2 tsps cumin 2 tsps onion powder 1 Tbs dried parsley 2 tsps salt First, slice up the onions and place them on the bottom of the crock pot. Then, mix the spices together to form a dry rub. Rub the spices all over the meat. Attack any children nearby. Place meat on top of the onions and close the crock pot lid. Cook the meat for 5-6 hours on high. Then lower the heat to low and cook an additional 3-4 hours. You do not have to add any liquid. At the end of the cooking time, your pork will look like this: I recommend taking the roast out and draining all of that fat. Including the fat is super yummy, but it isn’t needed. The meat is still very moist and flavorful without it. Shred the meat and serve. We chose to have carnitas burritos the night we made it. 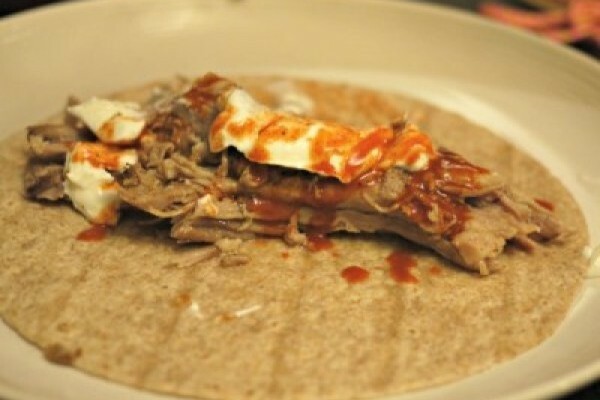 We used whole wheat tortillas with sour cream and Tapatio sauce. You can eat the meat just by itself too (as Erik chose to do). This recipe makes a lot of food. Leftover carnitas make an excellent salad topping as well, if you aren’t up to eating a plethora of carnitas burritos. However, this meat is so good, using a fork to eat it straight out of the refrigerator works as well. Original recipe from Everyday Paleo. Conversation with my daughter: Cam: Mama, I want to make a surprise for Daddy. Me: Ok, what should we make? Cam: Something with chocolate because Daddy REALLY likes chocolate. Since I knew anything we made, she (and I) would end up consuming as well, I wanted to keep this treat on the healthier side. A few years ago, I read in Runner’s World that chef Richard Blais (from Top Chef) dips pieces of clementine in dark chocolate for a mini indulgence. I thought this sounded easy and fantastic, so.. This is incredibly easy to do. All we used were dark cocoa candy melts and clementines. 1. Line a baking sheet with waxed paper or parchment paper. 2. Peel clementines and divide into slices. Make sure to remove any stringy pith from the slices. 3. Follow directions on candy melts to melt the chocolate. I used the microwave. 4. 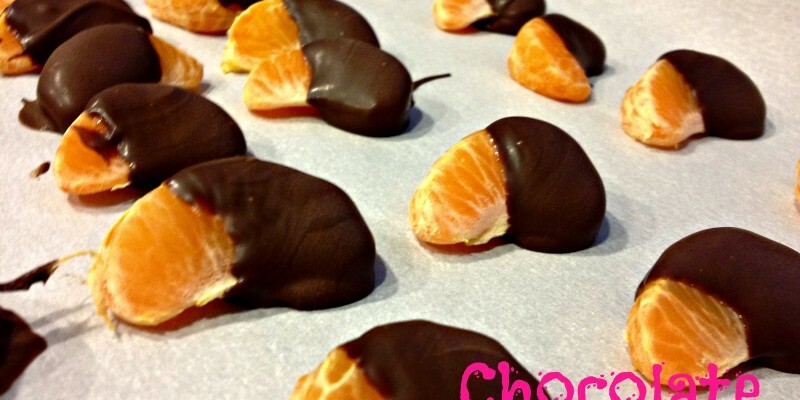 Dip half of clementine slice in melted chocolate. Let the excess chocolate drip off into the bowl. Lay the dipped clementine slice on the baking sheet. 5. Place cookie sheet in the refrigerator to harden for half an hour. We like our clementines cold, so to store them I simply took them off the cookie sheet and placed them in a Tupperware container in the refrigerator. They lasted about 2 days…. because we ate them. Do you have any easy, healthy snacks to recommend? Please tell us in the comments below! “I can do this. I can do this,” I tell myself as I peel myself up from the couch. My son has a fever, I feel achy and cooking dinner does not sound fun. “Mmmm.. Someburros,” briefly crosses my mind and I mention it to my daughter. After my afternoon with a very discontent 7-month-old, I really want to get frozen yogurt tonight. I can’t justify greasy, delicious Mexican food and frozen yogurt. So, frozen yogurt wins and I get up. Thankfully, this recipe is really easy and incredibly healthy (which really means more calories for frozen yogurt). I found it on the Fitness Magazine website and have adapted it from there. You need: 4 crushed garlic cloves 2 limes 2 tsps chili powder 2 tsps cumin 1 lb salmon, cut in 4-5 oz portions (I like the skin still on, I’ll tell you why) 1 1/2 cups frozen corn (defrosted) 1/2 red onion, sliced 1 red bell pepper, sliced 1 Anaheim chili sliced 1 Tbs olive oil 1/2 cup reduced fat sour cream 2 tbs chopped cilantro salt Preheat oven to 425 degrees. Prepare two baking sheets by covering them with aluminum foil. I do this because I hate clean-up and this simple step just makes it easier. First, mix the garlic, juice from 1 lime, chili powder and cumin in a shallow baking dish. Stir until it resembles a thin paste coating the bottom of the dish. Place the salmon skin side up in the dish and let marinate (at least 15 minutes). Next, mix the corn, red bell pepper, red onion and Anaheim chili in a bowl. Toss with olive oil, salt and pepper. In a seperate bowl, mix the sour cream, juice from 1 lime, and cilantro. Salt to taste. Place this in the refrigerator until you are ready to serve. Remove salmon from marinade and place skin side down on baking sheet. Do not spray this baking sheet with cooking oil. The skin of the salmon will stick to the foil, thus letting you serve a perfect skinless filet of salmon. Toss remaining marinade from salmon with vegetables. Spray second baking sheet with cooking oil. Spread vegetables out on cooking sheet. Place both baking sheets in preheated oven for 8-10 minutes. Remove and plate your entree! Spoon a large helping of veggies on a dinner plate, place a filet on top and spoon sour cream sauce on top. Yum! My 7-month-old loved the salmon. Even though he was feeling sick, he kept asking for more little bites. My five-year-old complains about all food these days (unless the food is covered with cheese. She was very upset when I decided against Someburros). She ate a little bit of this with very little complaining. Victory! Comment below to let us know if you try this recipe. Also, let us know any helpful cooking tips you might use!